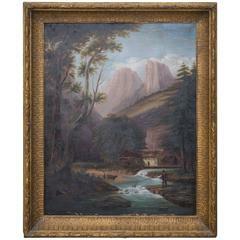 American, 19th-early 20th century, Hudson Valley river school painting oil on canvas by Jessie a rice caldwell. The painting measure about 23 inches x 36 inches. The frame is about 28 inches x 42 inches. Info verso: Painted as a present for her husband, William Caldwell for their wedding Dec 25th 1888. The painting is in excellent antique condition. Oil painting Cuzco school St Felipe with a beautiful 17th or 18th century frame the painting has been recanvassed.